2015: It's that Time Again! The fact that I am writing this while sitting in my bed, in my pajamas, might imply that my convictions are lacking. But if you've been following my resolutions for the past few years, you'll know that I've wisely chosen to focus my life altering plans on things that I already love doing. 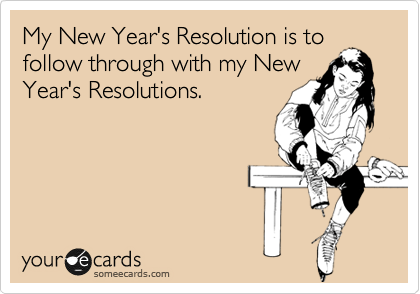 My resolutions aren't so much about change than they are about refinement. Did I achieve the goals I set out last year? Well, I read books, I played games, and I wrote lots of words, so yes. Yes I did. So I will maintain this momentum with more of the same. READING: While last year's 120 reads was a pretty solid showing, it is less than the 150 I had aimed for. This year, I'm going with 100. Then when I blow that number out of the water by the end of the year, I'll be able to walk around like an over achieving boss. GAMING: That Steam Wall of Shame continues to grow, though at a slower pace than in the past. I only bought two new games in the recent holiday sale (mostly because the ones that tempted me turned out to be already in my library). There are some games coming out this year that I know I will be playing, such as The Witcher 3 and Batman: Arkham Knight. I need to play the prequels in preparation. Plus I want to roll through Dragon Age: Inquisition again with my dwarf. But there are other games that I want to play this year, including Valkyria Chronicles, which just landed on PC. I want to play more Indie games. WRITING: This is where I really want to get serious. I did a lot of writing last year, including a successful ghostwriting project from which I learned a lot. Another project will hopefully come to fruition this year. I want to write more unique articles/regular features for both Women Write About Comics and The BiblioSanctum, while still keeping a few crazy ideas for my personal blog. But my real goal for the year is to get serious about my own personal projects. I have stories that have been sitting in my head for over a decade, and while I've begun the process of getting them out of there, I really need to tighten up my focus. I want to say I need to pick one and get it done, but I tend to work well when I have multiple projects. So step one is picking, perhaps three projects. And then find a way to write more regularly and without distraction. MISC: There are a few other things on my 2015 plans list. These are not so much resolutions, as new and continuing adventures. My husband bought me a lovely cast iron tea pot for Christmas, so I'm looking at augmenting my reading and writing moments with some lovely tea blends. My new job continues to be great and new opportunities may present themselves that I plan to jump on. I want to do some convention planning and get more out of the conventions I hope to attend. Maybe even cross the border for one. [ETA] MUSIC:. I enjoy music, but I don't *know* music well enough. I have a few friends who are always finding me new and interesting songs, and while I do often find things through Songza or from television shows, I want to be more active about this new music procurement. Spotify's NewMusicResolution will help. So there you have it. 2015 in a nutshell. I'm still in my pajamas. I am still in my bed. But the cool thing is that, with the magic of my laptop, my major resolutions actually don't require me to get up and/or put on pants.